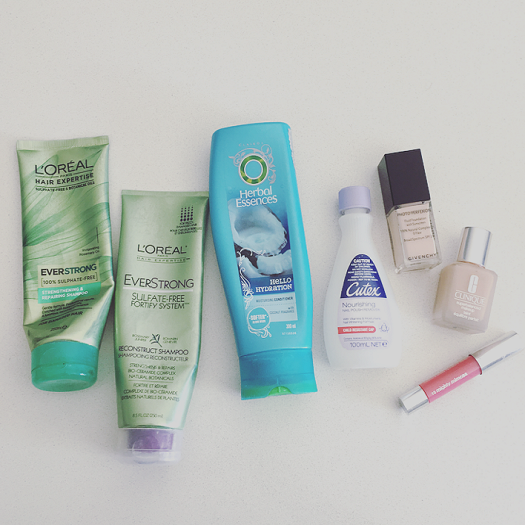 01: L’Oreal Everstrong Reconstruct Shampoo – I really liked this shampoo, and I would happily purchase it again. I’ve found it difficult to find “drug store” hair products that don’t weigh down my fine hair, but this does a really good job of cleaning and leaving my hair soft without stripping or weighing it down. 02: L’Oreal Everstrong Reconstruct Shampoo – Don’t ask me why I had two of these tubes kicking around in my shower, but I did. As above, I loved this and would definitely repurchase it (after I’ve finished my Project Pan, of course). 03: Herbal Essences Hello Hydration Conditioner – This is probably my number one favourite drugstore hair care range. As with the L’Oreal Everstrong, this shampoo & conditioner duo works really well with fine hair, although I will say that this works a little bit better in adding silkiness and shine to the hair but they’re pretty much on-par in every other way. 04: Cutex Nourishing Nail Polish Remover – My first empty of the year! I had a back up of this ready to go once I’d finished this bottle because it’s my favourite nail polish remover. It smells good(? ), and it works well to remove polish but still feels nice and gentle on my nails. 05: Givenchy Photo Perfexion Foundation in Perfect Ivory – I’m only able to include this in my Project 50 Pan tally because I already had a replacement in my stash ready and waiting. All future bottles of this will not be considered, because they will be replacements of something I’ve already finished up this year. Still my number one foundation. 06: Clinique Superbalanced Makeup in Alabaster – As above, I’m only able to include this because I had another bottle ready and waiting to go once this was finished. I only use this to help darken my Givenchy Foundation, which is slightly too light for me during summer. If I wear this alone it’s too dark, so I need to mix the two to find balance. 07: Clinique Chubby Stick in Mighty Mimosa – I was in two minds about including this, because I was seriously tempted to repurchase it. I talked myself out of it, because I have some other summery lip products that I want to try and finish up and get rid of. 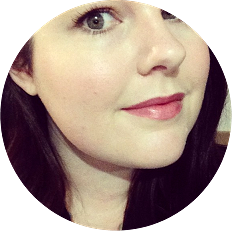 This is my most worn lip colour in the warmer months, I l-o-v-e it and I’m so sad to see it go. 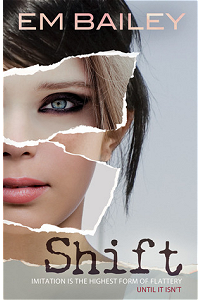 Book: Shift by Em Bailey – paperback edition, 304 pages. Synopsis: Olive Corbett is not crazy. Not anymore. But there’s no avoiding Miranda Vaile. As mousy Miranda edges her way into the popular group, right up to the side of queen bee Katie – and pushes the others right out – only Olive seems to notice that something strange is going on. Something almost… parasitic. Either Olive is losing her grip on reality, or Miranda Vaile is stealing Katie’s life. My thoughts: Honestly, there is nothing worse for me than starting a book only to find out it has paranormal themes in it. Not my scene at all. In this case, it is entirely my fault because I did little to no research before picking this up. I liked Em Bailey’s book ‘The Special Ones’, so I thought I’d give this a go. I persevered with this despite the fact it included paranormal themes, mostly just because it’s rare for me to stop reading a book once I’ve started. It has to be truly terrible for that to happen. There really wasn’t much I liked about this book. I did like that it was set in Australia, although it took me a while to figure that out (not until the protagonist started using “mum” instead of “mom”). I didn’t like any of the characters in the book, and at one point the main character pissed me off so much I nearly gave up on reading. Who leaves their baby brother home alone (granted, asleep) and goes out to party? I really wish there had been repercussions following that to serve as some sort of lesson, but nope – things carried on as usual. There was also an insta-love thing playing out throughout the book, which I’ve never been a big fan of. All things considered I actually didn’t mind the paranormal element of this book, it was probably the most interesting aspect of the story. I’m not sure I’d recommend this, but if you’re after a quick read that involves a unique kind of paranormal element, you might want to pick this up.